While filtering through photos, I always attempt to choose pictures where I am looking at the camera. Evidently, it never works out. So once again, here is another post with another outfit with some more generic pictures where I am looking away from the camera awkwardly in attempts to hide my tired-looking face. Thank god school is done in two days and I’ll be able to sleep in past 7AM. Perhaps then I will be able to force my face into looking less evil/scary and more cute…or something. Gap shirt, Aritzia cardigan via thrift, Thrifted shorts, Doc Marten boots. Today, my unsuspecting self made way to a “games” event that my YSDN pals were holding in one of the labs. Though I originally went solely for the free pizza, I found myself strangely involved in a couple of the games people were playing. I am normally not a “gamesy” person in the slightest (I even hate playing cards…. ), so I was kind of shocked at how competitive I got – especially when the game at hand kind of resembled Yu-Gi-Oh. ANYWAY, I ended up losing the game after my teammate ditched me for her boyfriend (cough cough), but I would still like to think that I gave a valiant effort. Pat on the back Dani. By Dani Roche on May 18, 2011 at 7:33 pm | Posted in outfits. 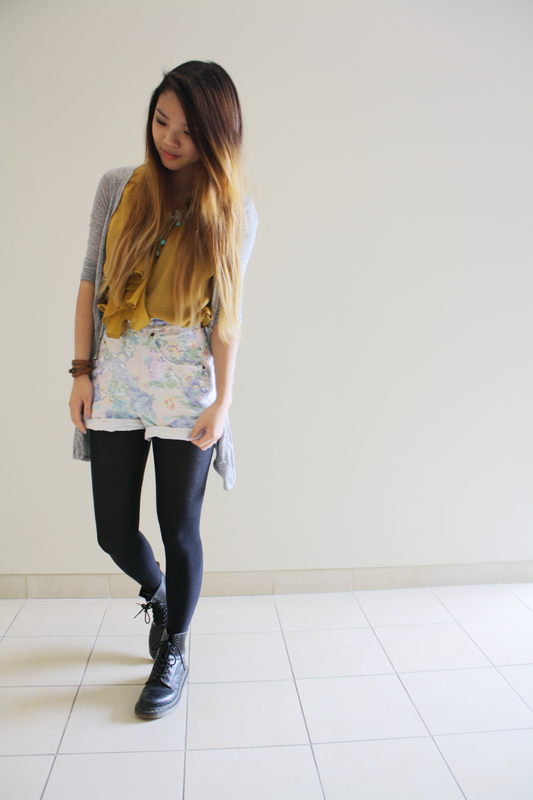 you’ve got lovely style and gorgeous hair. did you bleach your whole head and let it grow out or did you purposely bleach for the ombre look?